Niagara Gazette photos by Dan Cappellazzo in New York City covering the aftermath of the 9/11/2001 Terror Attacks. 010915 WCT/Firehouse memorial--dan cappellazzo photo--Fire Dept. of New York Rescue One Ladder retired Lieutenant Paul Geidel is emotional as he reads letter of support posted at a makeshift memorial in front of the 34th street firehouse. 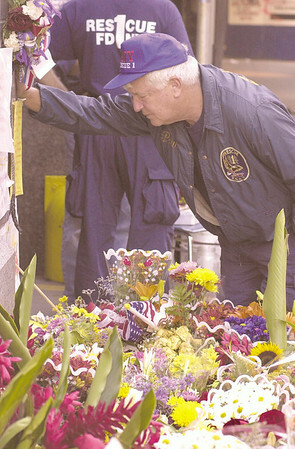 Geidel lost one of his two sons, both firefighters at Rescue One, in the WTC tragedy. Rescue One lost almost two full companies, suffering the most severe loss of all the NYC firehouses. 350 firefighters are reported missing in the tragedy.